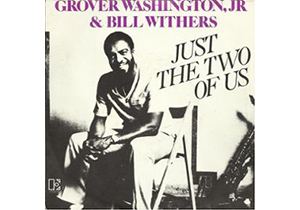 In this free guitar lesson you play through the chord changes featured in the song “Just the Two of Us” by Grover Washington Jr. and Bill Withers, plus take a look at how you can approach the chord progression with scales as a lead guitarist. You also explore how the chords may be played using a capo on an acoustic guitar. Because of the technicality of the theory, chord voicings, and scales, I consider this material only suitable for intermediate and advanced level players. Before you begin, I recommend you familiarize yourself with the original recording embedded in the video above. Scroll down to see a video of me jamming on the song. Verse/Chorus Option 1: To begin with, the music is considered to be in the key of F minor, although there are some chords borrowed from other keys as you soon see. Counting the tonic, F, as i (minor 1), the first chord, Dbmaj7, is a bVI (b6) chord, and the next, C7, is a V7 (5) chord, with the latter creating a harmonic minor push to the tonic, i, Fm. From here you play a type of ii-V-I (2-5-1) movement using the chords Ebm7-Ab7-Dbmaj7, as if you were in the key of Db and leading to the tonic. Notice how this set of chord changes turns you right back around to Dbmaj7, which eventually resolves on the tonic, Fm, by way of the C7 again. See Verse/Chorus Option 1 in the chord chart below. Verse/Chorus Option 2: You can add to this song’s jazzy sound by extending the chords to Dbmaj9 and C7b9, with the latter being altered because of the b9. Whereas the first option has nice voice leading chord to chord with the notes along the first string, this second option has descending movement along the second string. Cool stuff. Verse/Chorus Option 3: This option just shows you how you can move chromatically from Fm to Ebm7, similarly to what you hear in the original recording during the chorus. You can stay on Ebm7 for an extra beat as I have notated or switch to an Ab7 on beat four. Your call. There are certainly other options for playing the verse/chorus, such as playing different chord types and voicings, and playing in different positions, which you can explore on your own. I’m giving you a few options to get you started. Interlude: This song section is based on chromatic movement along the 6th string and alternates maj7 and 7#5 chords. At the end, you jump to a Gb13. When I jam on this song, I choose not to solo over this section. Using a capo: If you clamp a capo at the first fret, then you can play the main chord changes using fingerings for Cmaj7, B7, Em, Dm7, G7. In fact, you can capo anywhere or play in the key of E minor without a capo. See these easy guitar chords in the neck diagrams below. When it comes to adding melody and lead lines to the “Just the Two of Us” chord progression, you have several options. 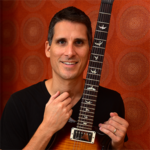 See the guitar neck diagrams below along with my instructions for each example. Your first option is to play the F minor pentatonic scale over everything. Even though the harmonic structure of this song is quite jazzy, rock- and blues-based minor pentatonic licks and phrases sound quite good over the chord progression, with the pentatonic notes relating in some way to each chord. A big advantage to using the pentatonic is that it’s by far the easiest of all the options. I have illustrated pentatonic pattern one (as I teach in my pentatonic course which is also part of Fretboard Theory), but you can, of course, play F minor pentatonic in any pattern or position. Your second option is to play a full F minor scale over the whole progression. F minor is drawn from Ab major. I have illustrated Ab major scale pattern five (as I teach in Fretboard Theory) because it fits together nicely with the first pentatonic pattern, but you can, of course, play the same notes in other patterns and positions. By playing a full minor scale you pick up two extra notes, G and Db, the 2nd and b6th, which provide for more melodic possibilities. One thing to avoid though is playing the 2nd, G, over the second half of the second measure. The G natural note will clash with the Gb note in the Ebm7 and Ab7 chords. More on this in option 4. A third option is to play the F harmonic minor scale, but only over the V7 chord, C7. The major 7th in the F harmonic minor scale is the major 3rd in the C7 chord. Before and after the C7 chord, use natural minor. In order to understand the fourth option you need to know where the chords in the second half of the second measure come from. In jazz styles, it’s common to use ii-V movement to lead to chords other than I. You see this with Ebm7-Ab7 leading to Dbmaj. Ebm7-Ab7 are ii-V in the Db major scale, and they’re borrowed here in order to bring the chord progression back around to Dbmaj7. 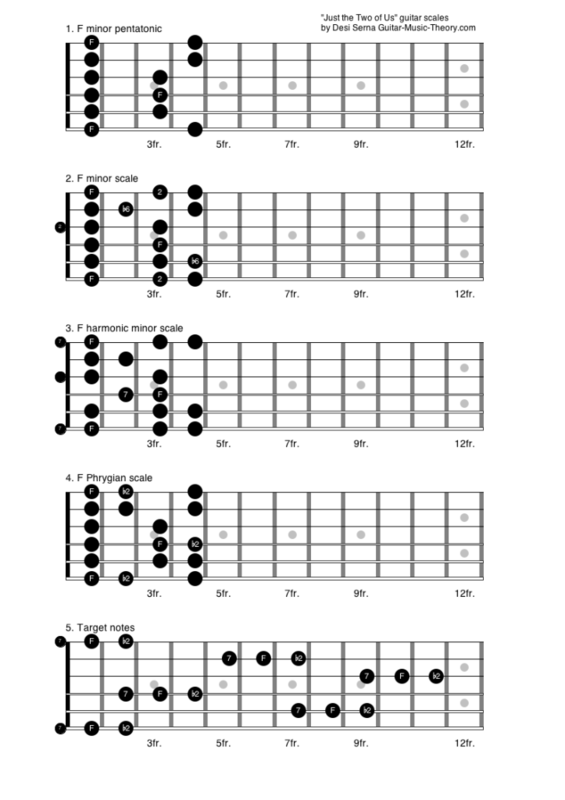 Since the chords are drawn from the Db major scale, you can play the Db scale over the Ebm7-Ab7 chords. Since your focus throughout the progression on the whole is F, you can think of the Db scale as starting from its third degree, F. In other words, you can think of the notes as F Phrygian, which is what I do and how I label the pattern you see in the neck diagram. The only difference between F natural minor and F Phrygian is the b2nd, Gb, so just temporary lower all G notes to Gb during the Ebm7-Ab7 chord changes. Return to F natural minor on the Dbmaj7 chord. If all this changing of scales is confusing to you, I offer one last option that allows you to add variation while keeping things relatively simple. If you think about the differences in the scale options outlined so far, you find that the critical notes are located a half-step below and a half-step above the tonic pitch, F. F natural minor features an F natural, F harmonic minor features an E, and F Phrygian features a Gb. As you navigate the chord changes, you can target these notes as you go. Looking at the whole progression chord by chord, it works like this: Play an F natural over Dbmaj7 (it’s the 3rd in this chord and is a strong guide tone). Play E over C7 (E is the 3rd in C7). Play F over Fm. Play Gb on Ebm7-Ab7 (3rd and b7th, both strong guide tones). You’re circled around now, play an F natural over Dbmaj7 again, E over C7 again, and F over Fm again. This is what I like to do, thinking about F minor pentatonic or F natural minor as my base scale as I go. When I target the major 7th E, I’m careful to avoid the b7th, Eb. When I target the b2nd, Gb, I avoid the 2nd, G. By making these adjustments to the scale as I play, I’m able to create melodic variation, and I tie my lead lines closely to the chords much like a jazz guitarist would do. 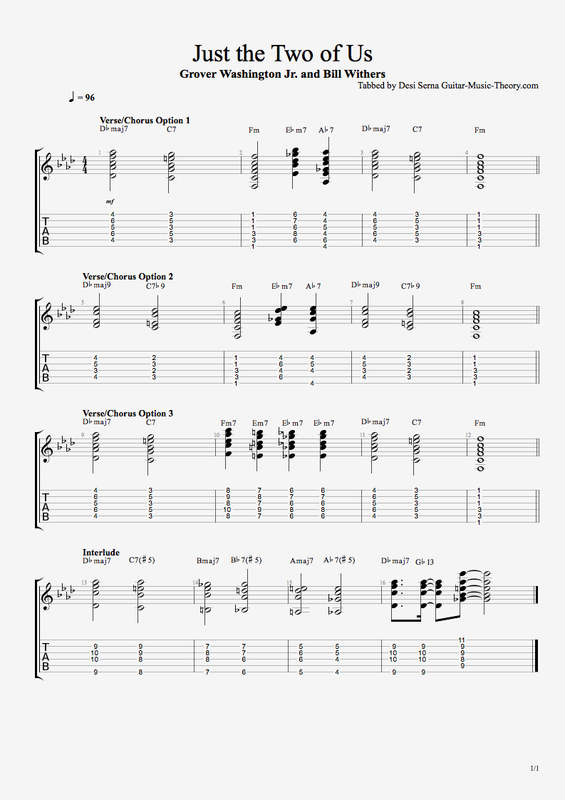 One more thing to note is that I prefer to jam on this song in the key of G minor by transposing everything up a whole-step because it gives me more room to work the scale patterns. I missed the recent session with Steve about this song. could you please send me the sheet that you used for it? i’d appreciate it. thank you. Thank you! Great lesson on what scales and why to use them. I play this song in Em (easier on my voice) using these changes Cmaj7 B7 Em7 Fmaj7, and it seems to work out okay. As you noted, leads in Em also suffice for me. Thanks very much!! An interesting approach to this song and I will take the solo choices and use some of them. Thank you. Thanks so much for this. There are a lot of version around on the internet, most of which are partly (or just plain) wrong. This really helps!